The present invention further relates to methods of treating or cleaning a surface, especially hard surfaces, with the premoistened wipes of the present invention. FIG. 1 a is a top view of a substrate of the present invention. FIG. 1 b is a cross-sectional view of the substrate shown in FIG. 1a along line B-B′. It is preferred that the various layers herein are bonded to one another via patterned thermal bonding. Patterned thermal bonding refers to a process of bonding a nonwoven web in a pattern by the application of heat and pressure. Pattern bonding typically is carded out at a temperature in a range of from about 80° C. to about 180° C. and a pressure in a range of from about 150 to about 1,000 pounds per linear inch (from about 59 to about 178 kg/cm). The pattern employed typically will have from about 10 to about 250 bonds/inch 2 (1-40 bonds/cm2) covering from about 5 to about 30 percent of the wipe surface area. Such pattern bonding is accomplished in accordance with known procedures. See, for example, U.S. Design Pat. No. 239,566 to Vogt, U.S. Design Pat. No. 264,512 to Rogers, U.S. Pat. No. 3,855,046 to Hansen et al., and U.S. Pat. No. 4,493,868, supra, for illustrations of bonding patterns and a discussion of bonding procedures, which patents are incorporated herein by reference. A preferred multi-layer substrate of the present invention is shown in FIGS. 1 a and 1 b. This preferred substrate 100 is a carded thermal bonded nonwoven substrate comprising three carded fiber layers (two surface contact layers 110 and one reservoir layer 115, positioned between the two surface contact layers 110) thermally bonded together with a 7-point pattern and a total basis weight of 70 gsm. The overall fiber composition of this preferred substrate is about 52% hydrophilic polypropylene (2.2 denier per filament (“dpf”), 38 mm length, FiberVisions Americas Type 193), about 31% viscose rayon (1.5 dpf, 40 mm length, Acordis Cellulosic Fibers, Inc. T-1099), and about 18% PET (6.0 dpf, 50 mm, Wellman, Inc. Type 204). Average caliper for the composite web substrate is about 0.63 mm and it has a density of 0.108 g/cm3. The multi-layer substrate  100 is thermally bonded with a plurality of thermal point bonds 105. The thermal point bonds 105 form a continuous 7-point pattern. FIG. 1b depicts a cross-sectional view of the multi-layer substrate 100 shown in FIG. 1a. The two surface contact layers 110 are made of a homogenous blend of about 60% hydrophilic polypropylene (2.2 dpf, 38 mm length, FiberVisions Americas Type 193), about 10% viscose rayon (1.5 dpf, 40 mm length, Acordis Cellulosic Fibers, Inc. T-1099), and about 30% PET (6.0 dpf, 50 mm, Wellman, Inc. Type 204) and each surface contact layer 110 has a basis weight of about 20.5 gsm. The reservoir layer 115, positioned between the two surface contact layers 110, is made of a homogenous blend of about 40% hydrophilic polypropylene (2.2 dpf, 38 mm length, FiberVisions Americas Type 193) and about 60% viscose rayon (1.5 dpf, 40 mm length, Acordis Cellulosic Fibers, Inc. T-1099) with a basis weight of about 29.0 gsm. The preferred multi-layer substrate shown in FIGS. 1 a and 1 b is made according to the following process. The reservoir layer 115 is made by blending (by weight) about 40% hydrophilic polypropylene (2.2 dpf, 38 mm length, FiberVisions Americas Type 193) and about 60% viscose rayon (1.5 dpf, 40 mm length, Acordis Cellulosic Fibers, Inc. T-1099). These blends are fed into two cards (about 14.5 gsm per card) to form a reservoir layer 115 with an overall basis weight of about 29.0 gsm. After carding, the reservoir layer 115 is embossed with a continuous 7-point pattern at about 300° F. and about 540 pounds per square inch (“psi”) and wound for later use in forming the multi-layer substrate 100. The two surface contact layers  110 are made by blending (by weight) of about 60% hydrophilic polypropylene (2.2 dpf, 38 mm length, FiberVisions Americas Type 193), about 10% viscose rayon (1.5 dpf, 40 mm length, Acordis Cellulosic Fibers, Inc. T-1099), and about 30% PET (6.0 dpf, 50mm, Wellman, Inc. Type 204). These blends are fed into two cards (top and bottom, about 20.5 gsm per card). In forming the multi-layer substrate 100:(1) the bottom carded fiber layer is placed on a moving conveyor, (2) the pre-made center reservoir layer is unwound on top of the bottom carded fiber layer, and (3) the top carded fiber layer is placed on top of the pre-formed center web and the bottom carded fiber layer. These three fibrous web layers are thermally embossed together with a continuous 7-point pattern at about 300° F. and about 540 psi. The resultant web formed has an average basis weight of about 70 gsm, an average caliper of about 0.63 mm, and an average density of about 0.108 g/cm3. Suitable anionic surfactants for use herein include alkyl sulphates. Suitable alkyl sulphates for use herein include water-soluble salts or acids of the formula ROSO 3M wherein R is a C6-C24 linear or branched, saturated or unsaturated alkyl group, preferably a C8-C20 alkyl group, more preferably a C8-C16 alkyl group and most preferably a C10-C14 alkyl group, and M is H or a cation, e.g., an alkali metal cation (e.g., sodium, potassium, lithium), or ammonium or substituted ammonium (e.g., methyl-, dimethyl-, and trimethyl ammonium cations and quaternary ammonium cations, such as tetramethyl-ammonium and dimethyl piperdinium cations and quaternary ammonium cations derived from alkylamines such as ethylamine, diethylamine, triethylamine, and mixtures thereof, and the like). Suitable anionic surfactants for use herein further include alkyl aryl sulphates. Suitable alkyl aryl sulphates for use herein include water-soluble salts or acids of the formula ROSO 3M wherein R is an aryl, preferably a benzyl, substituted by a C6-C24 linear or branched saturated or unsaturated alkyl group, preferably a C8-C20 alkyl group and more preferably a C10-C 16 alkyl group and M is H or a cation, e.g., an alkali metal cation (e.g., sodium, potassium, lithium, calcium, magnesium and the like) or ammonium or substituted ammonium (e.g., methyl-,dimethyl-, and trimethyl ammonium cations and quaternary ammonium cations, such as tetramethyl-ammonium and dimethyl piperdinium cations and quaternary ammonium cations derived from alkylamines such as ethylamine, diethylamine, triethylamine, and mixtures thereof, and the like). Suitable anionic surfactants for use herein further include alkoxylated sulphate surfactants. Suitable alkoxylated sulphate surfactants for use herein are according to the formula RO(A) mSO3M wherein R is an unsubstituted C6-C24 alkyl, hydroxyalkyl or alkyl aryl group, having a linear or branched C6-C24 alkyl component, preferably a C12-C20 alkyl or hydroxyalkyl, more preferably C12-C18 alkyl or hydroxyalkyl, A is an ethoxy or propoxy or butoxy unit or a mixture thereof, m is greater than zero, typically between 0.5 and 6, more preferably between 0.5 and 3, and M is H or a cation which can be, for example, a metal cation (e.g., sodium, potassium, lithium, calcium, magnesium, etc. ), ammonium or substituted-ammonium cation. Alkyl ethoxylated sulphates, alkyl butoxylated sulphates as well as alkyl propoxylated sulphates are contemplated herein. Specific examples of substituted ammonium cations include methyl-, dimethyl-, trimethyl-ammonium and quaternary ammonium cations, such as tetramethyl-ammonium, dimethyl piperdinium and cations derived from alkanolamines such as ethylamine, diethylamine, triethylamine, mixtures thereof, and the like. Exemplary surfactants are C12-C18 alkyl polyethoxylate (1.0) sulphate (C12-C18E(1.0)SM), C12-C18 polyethoxylate (2.25) sulphate (C12-C18E(2.25)SM), C12-C18 alkyl polyethoxylate (3.0) sulphate (C12-C18E(3.0)SM), and C12-C18 alkyl polyethoxylate (4.0) sulphate (C12-C18E(4.0)SM), wherein M is conveniently selected from sodium and potassium. Suitable anionic surfactants for use herein further include alkyl sulphonates. Suitable alkyl sulphonates for use herein include water-soluble salts or acids of the formula RSO 3M wherein R is a C6-C20 linear or branched, saturated or unsaturated alkyl group, preferably a C8-C18 alkyl group and more preferably a C14-C17 alkyl group, and M is H or a cation, e.g., an alkali metal cation (e.g., sodium, potassium, lithium), or ammonium or substituted ammonium (e.g., methyl-, dimethyl-, and trimethyl ammonium cations and quaternary ammonium cations, such as tetramethyl-ammonium and dimethyl piperdinium cations and quaternary ammonium cations derived from alkylamines such as ethylamine, diethylamine, triethylamine, and mixtures thereof, and the like). Suitable anionic surfactants for use herein further include alkyl aryl sulphonates. Suitable alkyl aryl sulphonates for use herein include water-soluble salts or acids of the formula RSO 3M wherein R is an aryl, preferably a benzyl, substituted by a C6-C20 linear or branched saturated or unsaturated alkyl group, preferably a C8-C18 alkyl group and more preferably a C9-C14 alkyl group, and M is H or a cation, e.g., an alkali metal cation (e.g., sodium, potassium, lithium, calcium, magnesium and the like) or ammonium or substituted ammonium (e.g., methyl-,dimethyl-, and trimethyl ammonium cations and quaternary ammonium cations, such as tetramethyl-ammonium and dimethyl piperdinium cations and quaternary ammonium cations derived from alkylamines such as ethylamine, diethylamine, triethylamine, and mixtures thereof, and the like). Particularly suitable alkyl sulphonates include C 14-C17 paraffin sulphonate like Hostapur® SAS commercially available from Hoechst. An example of commercially available alkyl aryl sulphonate is Lauryl aryl sulphonate from Su.Ma., Particularly preferred alkyl aryl sulphonates are alkyl benzene sulphonates commercially available under trade name Nansa® available from Albright&Wilson. Suitable anionic surfactants for use herein further include alkoxylated sulphonate surfactants. Suitable alkoxylated sulphonate surfactants for use herein are according to the formula R(A) mSO3M wherein R is an unsubstituted C6-C20 alkyl, hydroxyalkyl or alkyl aryl group, having a linear or branched C6-C20 alkyl component, preferably a C12-C20 alkyl or hydroxyalkyl, more preferably C12-C18 alkyl or hydroxyalkyl, A is an ethoxy or propoxy or butoxy unit, m is greater than zero, typically between 0.5 and 6, more preferably between 0.5 and 3, and M is H or a cation which can be, for example, a metal cation (e.g., sodium, potassium, lithium, calcium, magnesium, etc. ), ammonium or substituted-ammonium cation. Alkyl ethoxylated sulphonates, alkyl butoxylated sulphonates as well as alkyl propoxylated sulphonates are contemplated herein. Specific examples of substituted ammonium cations include methyl-,dimethyl-, trimethyl-ammonium and quaternary ammonium cations, such as tetramethyl-ammonium, dimethyl piperdinium and cations derived from alkanolamines such as ethylamine, diethylamine, triethylamine, mixtures thereof, and the like. Exemplary surfactants are C12-C18 alkyl polyethoxylate (1.0) sulphonate (C12-C18E(1.0)SM), C12-C18 alkyl polyethoxylate (2.25sulphonate (C12-C18E(2.25)SM), C12-C18 alkyl polyethoxylate (3.0) sulphonate (C12-C18E(3.0)SM), and C12-C18 alkyl polyethoxylate (4.0) sulphonate (C12-C18E(4.0)SM), wherein M is conveniently selected from sodium and potassium. Particularly suitable alkoxylated sulphonates include alkyl aryl polyether sulphonates like Triton X-200® commercially available from Union Carbide. wherein R is a C 6-C20 linear or branched, saturated or unsaturated alkyl group, preferably a C6-C18 alkyl group and more preferably a C6-C14 alkyl group, and X+is H or a cation, e.g., an alkali metal cation (e.g., sodium, potassium, lithium, calcium, magnesium and the like). Particularly suitable C6-C20 alkyl alkoxylated linear or branched diphenyl oxide disulphonate surfactants to be used herein are the C12 branched di phenyl oxide disulphonic acid and C16 linear di phenyl oxide disulphonate sodium salt respectively commercially available by DOW under the trade name Dowfax 2A1® and Dowfax 8390®. Other suitable anionic surfactants for use herein include alkyl-carboxylates. Other anionic surfactants can include salts (including, for example, sodium, potassium, ammonium, and substituted ammonium salts such as mono-, di- and triethanolamine salts) of soap, C 8-C24 olefinsulfonates, sulfonated polycarboxylic acids prepared by sulfonation of the pyrolyzed product of alkaline earth metal citrates, e.g., as described in British Patent Specification No. 1,082,179; acyl glycerol sulfonates, fatty oleyl glycerol sulfates, alkyl phenol ethylene oxide ether sulfates, alkyl phosphates, isethionates such as the acyl isethionates, N-acyl taurates, alkyl succinamates and sulfosuccinates, monoesters of sulfosuccinate (especially saturated and unsaturated C12-C18 monoesters) diesters of sulfosuccinate (especially saturated and unsaturated C6-C14 diesters), acyl sarcosinates, sulfates of alkylpolysaccharides such as the sulfates of alkylpolyglucoside (the nonionic nonsulfated compounds being described below), branched primary alkyl sulfates, alkyl polyethoxy carboxylates such as those of the formula RO(CH2CH2O)kCH2COO-M+ wherein R is a C8-C22 alkyl, k is an integer from 0 to 10, and M is a soluble salt-forming cation. Resin acids and hydrogenated resin acids are also suitable, such as rosin, hydrogenated rosin, and resin acids and hydrogenated resin acids present in or derived from tall oil. Further examples are given in “Surface Active Agents and Detergents” (Vol. I and II by Schwartz, Perry and Berch). A variety of such surfactants are also generally disclosed in U.S. Pat. 3,929,678, issued Dec. 30, 1975 to Laughlin, et al. at Column 23, line 58 through Column 29, line 23. In one preferred embodiment, preferred anionic surfactants for use herein are the C 8-C16 alkyl sulfonates, C8-C16 alkyl sulfates, including branched alkyl sulphates, C8 -C16 alkyl alkoxylated sulfates (e.g., C8-C16 alkyl ethoxylated sulfates), C8-C16 alkyl alkoxylated sulphonates and mixtures thereof. Such anionic surfactants are preferred herein as it has been found that they contribute to the disinfecting properties of a disinfecting composition herein. For example, C8-C16 alkyl sulfate acts by disorganizing the bacteria cell membrane, inhibiting enzymatic activities, interrupting the cellular transport and/or denaturing cellular proteins. Indeed, it is speculated that the improved disinfecting performance further associated with the addition of an anionic surfactant, especially a C8-C16 alkyl sulfonate, a C8-C16 alkyl sulfate and/or a C 8-C16 alkyl alkoxylated sulfate, in a composition according to the present invention, is likely due to multiple mode of attack of said surfactant against the bacteria. In a second preferred embodiment, the anionic surfactant is selected from the group consisting of: C 6-C24 alkyl sulphates; C6-C24 alkyl aryl sulphates; C6-C24 alkyl alkoxylated sulphates; C6-C24 alkyl sulphonates, including paraffin sulphonates; C6-C24 alkyl aryl sulphonates; C6-C24 alkyl alkoxylated sulphonates; C6-C24 alkyl alkoxylated linear or branched diphenyl oxide disulphonates; naphthalene sulphonates; and mixtures thereof. More preferably the anionic surfactant is selected from the group consisting of : C6-C24 alkyl sulphonates; C6-C24 alkyl sulphates; C6-C24 alkyl alkoxylated sulphates; C6-C24 alkyl aryl sulphonates; and mixtures thereof. Even more preferably the anionic surfactant for use herein is a paraffin sulphonate. Most preferably the anionic surfactant for use herein is a C14-C17 paraffin sulphonate. Preferred hydrophobic nonionic surfactants for use in the compositions according to the present invention are surfactants having an HLB below 16 and being according to the formula RO-(C 2H4O)n(C3H60)mH, wherein R is a C6 to C22 alkyl chain or a C6 to C28 alkyl benzene chain, and wherein n+m is from 0 to 20 and n is from 0 to 15 and m is from 0 to 20, preferably n+m is from 1 to 15 and, n and m are from 0.5 to 15, more preferably n+m is from 1 to 10 and, n and m are from 0 to 10. The preferred R chains for use herein are the C8 to C22 alkyl chains. Accordingly, suitable hydrophobic nonionic surfactants for use herein are Dobanol® 91-2.5 (HLB=8.1; R is a mixture of C9 and C11 alkyl chains, n is 2.5 and m is 0), or Lutensol® ( TO3 (HLB=8; R is a C13 alkyl chains, n is 3 and m is 0), or Lutensol® AO3 (HLB=8; R is a mixture C13 and C15 alkyl chains, n is 3 and m is 0), or Tergitol® 25L3 (HLB=7.7; R is in the C12 to C15 alkyl chain length, n is 3 and m is 0), or Dobanol® 23-3 (HLB=8.1; R is a mixture of C12 and C13 alkyl chains, n is 3 and m is 0), or Dobanol® 23-2 (HLB=6.2; R is a mixture of C12 and C13 alkyl chains, n is 2 and m is 0), or Dobanol® 45-7 (HLB=11.6; R is a mixture of C14 and C15 alkyl chains, n is 7 and m is 0) Dobanol® 23-6.5 (HLB=11.9; R is a mixture of C12 and C13 alkyl chains, n is 6.5 and m is 0), or Dobanol® 25-7 (HLB=12; R is a mixture of C12 and C15 alkyl chains, n is 7 and m is 0), or Dobanol® 91-5 (HLB=11.6; R is mixture of C9 and C11 alkyl; chains, n is 5 and m is 0), or Dobanol® 91-6 (HLB=12.5; R is a mixture of C9 and C11 alkyl chains, n is 6 and m is 0), or Dobanol® 91-8 (HLB=13.7; R is a mixture of C9 and C11 alkyl chains, n is 8 and m is 0), Dobanol® 91-10 (HLB=14.2; R is a mixture of C9 to C11 alkyl chains, n is 10 and m is 0), or mixtures thereof. Preferred herein are Dobanol® 91-2.5, or Lutensol® TO3, or Lutensol® AO3, or Tergitol® 25L3, or Dobanol® 23-3, or Dobanol® 23-2, or mixtures thereof. These Dobanol® surfactants are commercially available from SHELL. These Lutensol® surfactants are commercially available from BASF and these Tergitol® surfactants are commercially available from UNION CARBIDE. In a preferred embodiment the nonionic surfactant herein is an alkoxylated nonionic surfactant according to the formula RO-(A) nH, wherein : R is a C6 to C22, preferably a C8 to C22, more preferably a C9 to C14 alkyl chain, or a C6 to C28 alkyl benzene chain; A is an ethoxy or propoxy or butoxy unit; and wherein n is from 0 to 20, preferably from 1 to 15 and, more preferably from 2 to 15 even more preferably from 2 to 12 and most preferably from 4 to 10. Preferred R chains for use herein are the C8 to C22 alkyl chains. Even more preferred R chains for use herein are the C9 to C12 alkyl chains. Ethoxy/butoxylated, ethoxy/propoxylated, butoxy/propoxylated and ethoxy/butoxy/propoxylated nonionic surfactants may also be used herein. Preferred alkoxylated nonionic surfactants are ethoxylated nonionic surfactants. Suitable alkylpolysaccharides for use herein are disclosed in U.S. Pat. No. 4,565,647, Llenado, issued Jan. 21, 1986, having a hydrophobic group containing from about 6 to about 30 carbon atoms, preferably from about 10 to about 16 carbon atoms and a polysaccharide, e.g., a polyglycoside, hydrophilic group. For acidic or alkaline cleaning compositions/solutions suitable for use in no-rinse methods, the preferred alkyl polysaccharide preferably comprises a broad distribution of chain lengths, as these provide the best combination of wetting, cleaning, and low residue upon drying. This “broad distribution” is defined by at least about 50% of the chainlength mixture comprising from about 10 carbon atoms to about 16 carbon atoms. Preferably, the alkyl group of the alkyl polysaccharide consists of a mixtures of chainlength, preferably from about 6 to about 18 carbon atoms, more preferably from about 8 to about 16 carbon atoms, and hydrophilic group containing from about one to about 1.5 saccharide, preferably glucoside, groups per molecule. This “broad chainlength distribution” is defined by at least about 50% of the chainlength mixture comprising from about 10 carbon atoms to about 16 carbon atoms. A broad mixture of chain lengths, particularly C 8-C16, is highly desirable relative to narrower range chain length mixtures, and particularly versus lower (i.e., C8-C10 or C8-C12) chainlength alkyl polyglucoside mixtures. It is also found that the preferred C8-C16 alkyl polyglucoside provides much improved perfume solubility versus lower and narrower chainlength alkyl polyglucosides, as well as other preferred surfactants, including the C8-C14 alkyl ethoxylates. Any reducing saccharide containing 5 or 6 carbon atoms can be used, e.g., glucose, galactose and galactosyl moieties can be substituted for the glucosyl moieties. (optionally the hydrophobic group is attached at the 2-, 3-, 4-, etc. positions thus giving a glucose or galactose as opposed to a glucoside or galactoside.) The intersaccharide bonds can be, e.g., between the one position of the additional saccharide units and the 2-, 3-, 4-, and/or 6-positions on the preceding saccharide units. The glycosyl is preferably derived from glucose. In the alkyl polyglycosides, the alkyl moieties can be derived from the usual sources like fats, oils or chemically produced alcohols while their sugar moieties are created from hydrolyzed polysaccharides. Alkyl polyglycosides are the condensation product of fatty alcohol and sugars like glucose with the number of glucose units defining the relative hydrophilicity. As discussed above, the sugar units can additionally be alkoxylated either before or after reaction with the fatty alcohols. Such alkyl polyglycosides are described in detail in WO 86/05199 for example. 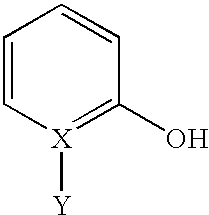 Technical alkyl polyglycosides are generally not molecularly uniform products, but represent mixtures of alkyl groups and mixtures of monosaccharides and different oligosaccharides. Alkyl polyglycosides (also sometimes referred to as “APG's”) are preferred for the purposes of the invention since they provide additional improvement in surface appearance relative to other surfactants. The glycoside moieties are preferably glucose moieties. The alkyl substituent is preferably a saturated or unsaturated alkyl moiety containing from about 8 to about 18 carbon atoms, preferably from about 8 to about 10 carbon atoms or a mixture of such alkyl moieties. C 8-C16 alkyl polyglucosides are commercially available (e.g., Simusol® surfactants from Seppic Corporation, 75 Quai d'Orsay, 75321 Paris, Cedex 7, France, and Glucopon® 425 available from Henkel. However, it has been found that purity of the alkyl polyglucoside can also impact performance, particularly end result for certain applications, including daily shower product technology. In the present invention, the preferred alkyl polyglucosides are those which have been purified enough for use in personal cleansing. Most preferred are “cosmetic grade” alkyl polyglucosides, particularly C8 to C16 alkyl polyglucosides, such as Plantaren 200 ®, Plantaren 2000 N®, and Plantaren 2000 N UP®, available from Henkel Corporation (Postfach 101100, D 40191 Dusseldorf, Germany). Suitable amphoteric surfactants for use herein include amine oxides having the following formula R 1R2R3NO wherein each of R1, R2 and R3 is independently a saturated substituted or unsubstituted, linear or branched hydrocarbon chains of from 1 to 30 carbon atoms. Preferred amine oxide surfactants to be used according to the present invention are amine oxides having the following formula R1R2R3NO wherein R1 is an hydrocarbon chain comprising from 1 to 30 carbon atoms, preferably from 6 to 20, more preferably from 8 to 16, most preferably from 8 to 12, and wherein R2 and R3 are independently substituted or unsubstituted, linear or branched hydrocarbon chains comprising from 1 to 4 carbon atoms, preferably from 1 to 3 carbon atoms, and more preferably are methyl groups. R1 may be a saturated substituted or unsubstituted linear or branched hydrocarbon chain. Suitable amine oxides for use herein are for instance natural blend C 8-C10 amine oxides as well as C12-C16 amine oxides commercially available from Hoechst and Clariant. wherein R 1 is a hydrophobic group; R2 and R3 are each C1-C4 alkyl, hydroxy alkyl or other substituted alkyl group which can also be joined to form ring structures with the N; R4 is a moiety joining the cationic nitrogen atom to the hydrophilic group and is typically an alkylene, hydroxy alkylene, or polyalkoxy group containing from 1 to 10 carbon atoms; and X is the hydrophilic group which is preferably a carboxylate or sulfonate group. Preferred hydrophobic groups R1 are alkyl groups containing from 1 to 24, preferably less than 18, more preferably less than 16 carbon atoms. The hydrophobic group can contain unsaturation and/or substituents and/or linking groups such as aryl groups, amido groups, ester groups and the like. In general, the simple alkyl groups are preferred for cost and stability reasons. Examples of particularly suitable betaine surfactants include C 12-C18 alkyl dimethyl betaine such as coconut-betaine and C10-C16 alkyl dimethyl betaine such as laurylbetaine. Coconutbetaine is commercially available from Seppic under the trade name of Amonyl 265®. Laurylbetaine is commercially available from Albright & Wilson under the trade name Empigen BB/L®. wherein each R 1 is a hydrocarbon, e.g. an alkyl group containing from 8 up to 20, preferably up to 18, more preferably up to 16 carbon atoms, each R2 is either a hydrogen (when attached to the amido nitrogen), short chain alkyl or substituted alkyl containing from one to 4 carbon atoms, preferably groups selected from the group consisting of methyl, ethyl, propyl, hydroxy substituted ethyl or propyl and mixtures thereof, preferably methyl, each R3 is selected from the group consisting of hydrogen and hydroxy groups and each n is a number from 1 to 4, preferably from 2 to 3, more preferably 3, with no more than one hydroxy group in any (C(R3)2) moiety. The R1 groups can be branched and/or unsaturated. The R2 groups can also be connected to form ring structures. A surfactant of this type is a C10-C14 fatty acylamidopropylene(hydroxypropylene)sulfobetaine that is available from the Sherex Company under the trade name “Varion CAS sulfobetaine”®. Excellent long lasting disinfection is obtained by treating a surface with a composition comprising a peroxygen bleach and an antimicrobial essential oil or active thereof as described herein, on a variety of microorganisms, e.g., the growth of Gram positive bacteria like  Staphylococcus aureus, and Gram negative bacteria like Pseudomonas aeroginosa as well as of fungi like Candida albicans is reduced or even prevented on a surface having been treated with said composition. Long lasting disinfection properties of the compositions herein may be measured by the bactericidal activity of said compositions. A test method suitable to evaluate the long lasting bactericidal activity of a composition may be as follow: First, the surfaces (e.g. glass) to be tested are respectively treated with either a composition according to the present invention or a reference composition, e.g., a negative control composed of pure water (for example by spraying the composition directly on the surface or first spraying the composition on a sponge used to clean the surface or when the composition herein is executed in the form of wipe by wiping the surface therewith). After a variable time frame (e.g. 24 hours) each surface is respectively inoculated with bacteria (10 6-7cfu/slide) cultured in for example TSB (Tryptone Soya Broth) and left typically from a few seconds to 2 hours before evaluating the remaining living bacteria. Then living bacteria (if any) are recovered from the surface (by touching TSA+neutraliser plates and by re-suspending the bacteria into the neutralisation broth and plating them on agar) and incubated at appropriate temperature, e.g. 37° C. to let them grow typically over night. Finally, a visual grading of the living bacteria is made by comparing side by side the cultures and/or dilutions thereof (e.g. 10−2 or 10−1) resulting from the surfaces treated with the compositions according to the present invention and the reference composition. The compositions of the present invention may comprise an additional surfactant. The additional surfactant may be selected from other nonionic, amphoteris, zwitterionic or anionic surfactants including but not limited to those described above. Alternatively the additional surfactant may include for example a cationic surfactant or a C 6-C20 conventional soaps (alkali metal salt of a C6-C20 fatty acid, preferably sodium salts). The Desorption Under Pressure Test Method utilizes an apparatus as shown in the block diagram of FIG. 2. The apparatus  200 contains the following components: three Plexiglass sheets 205 (127 mm×127 mm×6.4 mm); metal disk weights 210 (76.2 mm diameter) weighing about 227 grams, about 455 grams, and about 906 grams; a standard reference absorbent core material 215 (the standard reference absorbent core material 215 is a single 102 mm×102 mm piece of Ahlstrom No. 989 filter paper available from Ahlstrom Filtration, P.O. Box A, Mr. Holly Springs, Pa.), and a pre-moistened wipe test sample 220 (76.2 mm diameter). One of the Plexiglass sheets 207 is used as a weight (about 115 grams) for determining the amount of fluid desorbed from the test sample 220 of interest. A combination of metal disk weight(s) 210 and Plexiglass sheet(s) 207 is used to obtain the desired applied pressure load. In the Desorption Under Pressure Test Method, the substrate of the test sample  220 is premoistened to a specific level (i.e., X-Load which is grams of fluid per gram of dry fiber in wipe) with a liquid composition according to Composition H, infra. The premoistened wipe test sample 220 is placed and centered on top of the standard reference absorbent core material 215. A Plexiglass sheet 207 with the appropriate amount of metal disk weights 210 are placed (centered) on top of the premoistened wipe test sample 220. After about 30 seconds, the top Plexiglass sheet 207 and the associated metal disk weights 210 are removed. The premoistened wipe test sample 220 is weighed to determine the amount of fluid released (“desorbed”). The amount of desorption (or lotion loss) is expressed in X-Load (i.e., grams of fluid loss per gram of dry fiber in wipe). Substrate A is a multi-layer substrate as shown in FIGS. 1 a and 1 b and described in Section I, supra. Comparative Substrate D is a 73 gsm air laid substrate made of a homogenous blend of about 73% wood pulp (Weyherhaeuser NF405), about 15% polyester (DuPont 612W), and about 12% Cymel Binder. The web has an average caliper of 1.12 mm and average density of about 0.065g/cm 3.
wherein the total basis weight of said surface contacting layer(s) is from about 10% to about 95% of the total basis weight of said multi-layer substrate. 2. The multi-layer substrate of claim 1, wherein said first reservoir layer has a basis weight of at least about 15 gsm and comprises: (i) from about 25% to about 80%, by weight of said first reservoir layer, of hydrophilic fibers, and (ii) from about 25% to about 75%, by weight of said first reservoir layer, of hydrophobic fibers, wherein the total basis weight of said reservoir layer(s) is from about 20% to about 80% of the total basis weight of said multi-layer substrate; and wherein said first surface contacting layer has a basis weight of at least about 10 gsm and comprises: (i) from about 10% to about 75%, by weight of said first surface contacting layer, of hydrophilic fibers, and (ii) from about 25% to about 90%, by weight of said first surface contacting layer, of hydrophobic fibers, wherein the total basis weight of said surface contacting layer(s) is from about 20% to about 80% of the total basis weight of said multi-layer substrate. 3. The multi-layer substrate of claim 2, wherein said first reservoir layer has a basis weight of at least about 25 gsm and comprises: (i) from about 40% to about 50%, by weight of said first reservoir layer, of hydrophilic fibers, and (ii) from about 50% to about 60%, by weight of said first reservoir layer, of hydrophobic fibers, wherein the total basis weight of said reservoir layer(s) is from about 35% to about 60% of the total basis weight of said multi-layer substrate; and wherein said first surface contacting layer has a basis weight of at least about 20 gsm and comprises: (i) from about 20% to about 50%, by weight of said first surface contacting layer, of hydrophilic fibers, and (ii) from about 50% to about 80%, by weight of said first surface contacting layer, of hydrophobic fibers, wherein the total basis weight of said surface contacting layer(s) is from about 35% to about 60% of the total basis weight of said multi-layer substrate. 7. The multi-layer substrate of claim 1, wherein said substrate is essentially free of a binder material that is incompatible with a liquid composition. 8. The multi-layer substrate of claim 1, wherein said reservoir layer(s) are formed by a process selected from the group consisting of air laid, carded, cross lapped, spunbond, meltblown, wet laid, extruded, cast film, and combinations thereof. 10. The multi-layer substrate of claim 1, wherein said surface contacting layer(s) are formed by a process selected from the group consisting of air laid, carded, cross lapped, spunbond, meltblown, wet laid, extruded, cast film, and combinations thereof. 16. The multi-layer substrate of claim 1, wherein said multi-layer substrate further comprises a second surface contacting layer; wherein said second has a basis weight of at least about 5 gsm and comprises: (i) from about 0% to about 95%, by weight of said first surface contacting layer, of hydrophilic fibers, and (ii) from about 5% to about 100%, by weight of said first surface contacting layer, of hydrophobic fibers, wherein the total basis weight of said surface contacting layer(s) is from about 10% to about 95% of the total basis weight of said multi-layer substrate; wherein said first reservoir layer is positioned between said first surface contacting layer and said second surface contacting layer. 19. The premoistened wipe of claim 18, wherein said liquid composition is loaded onto said substrate at a level of from about 50% to about 600%, by weight of said substrate. 20. The premoistened wipe of claim 19, wherein said liquid composition is loaded onto said substrate at a level of from about 100% to about 400%, by weight of said substrate. 21. The premoistened wipe of claim 20, wherein said liquid compositions is loaded onto said substrate at a level of from about 200% to about 350%, by weight of said substrate. 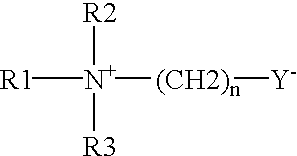 wherein R is a C6 to C22 alkyl group; A is an ethoxy, propoxy, or butoxy group; and n is from about 0 to about 20.